The past year was characterized by a high level of political uncertainty and central bank interventions. Global financial markets were highly influenced by monetary programs, especially by the US Federal Reserve (QE) and the Bank of Japan (Abenomics). Many journalists and analysts were, and still are, talking about competitive currency devaluation, also known as “currency war”. Many currencies were actively influenced by central banks, in some cases leading to dramatic currency devaluations, as seen for the Japanese Yen. The monetary programs were accompanied by massive problems in developing countries, e.g. Brazil and India. The QE programme of Western central banks led to a flow of cheap money to many emerging markets. In 2013, after the announcement of the FED to plan to reduce QE, so called “tapering”, investors withdrew huge sums of funds out of emerging markets. Nevertheless, many markets saw rising quotations. The best performer was the Japanese index TOPIX with a gain of 59.8% in 2013, followed by the S&P 500 with 30.4%. Cyclical consumer and health care stocks performed best with 39.6% and 34.5%, respectively. Whereas companies in the basic metals and utilities performed worse, returning 4.6% and 13.3%, respectively. 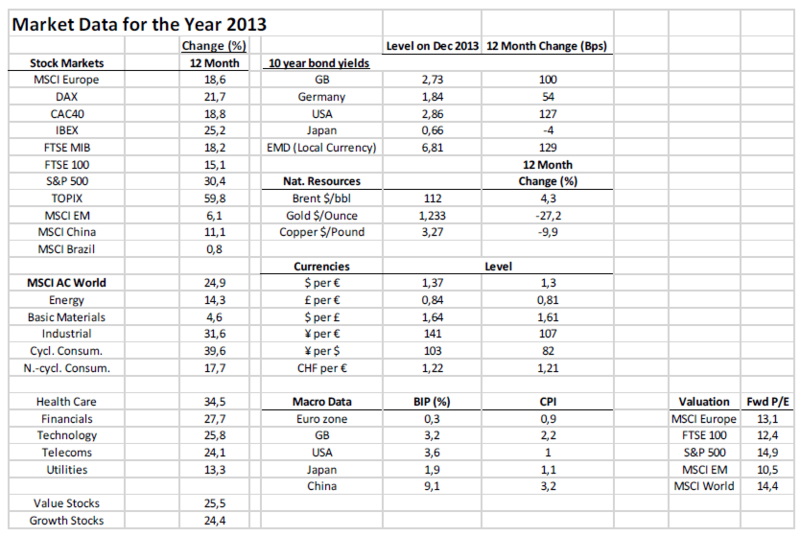 Performance for bond investors in 2013 was disappointing as most bonds lost value which is shown by rising bond yields. Yields on British Gilts and US treasuries rose by 1% and 1.27%, respectively. This performance makes government bonds one of the worst performing investments in 2013. However, performance of gold and some industrial metals was even worse. In Appendix 2 it shows that gold lost 27.2% of its value in 2013, which makes this year one of the worst years ever for gold. Copper also lost 9.9% in value over the year. The biggest currency move was made by the Japanese Yen. This move was enforced by the Bank of Japan to weaken the Yen in order to increase Japan’s economic competitveness. Other major currencies did not move much and showed a healthy, balanced behaviour in 2013. 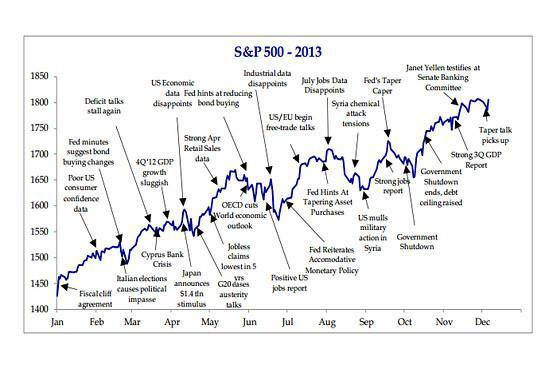 Appendix 1 shows the influence of major market events on the S&P 500. In a historical context, equities are not too expensive. 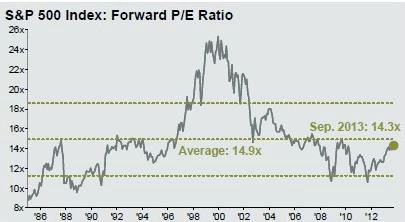 As seen in the figure to the left, average historical Forward Price to Earnings (P/E) ratio is 14.9, whereas current ratio stands at 14.3. JP Morgan provides these figures and they date back to September 2013. In the table below newer figures are shown for December 2013 with a forward P/E ratio on the S&P 500 of 14.9, which is exactly the historical average. Other markets are comparably cheaper, like Europe with 13.1 or the FTSE 100 with 12.4. Current valuation and the interest rate environment make us favor equity investments over other securities. Current interest rate structure supports our view on investing in equities. Central bank rates are lower than interest rates gained on investments like long-term government bonds, but also stocks. Low central bank rates lead to an attractive environment to invest into more risky, higher yielding securities. The investment class of Real Estate Investment Trusts should be an essential part of every investor’s portfolio. However, we are neutral on REITs over the next year as tapering will have a negative effect on housing prices and mortgages. 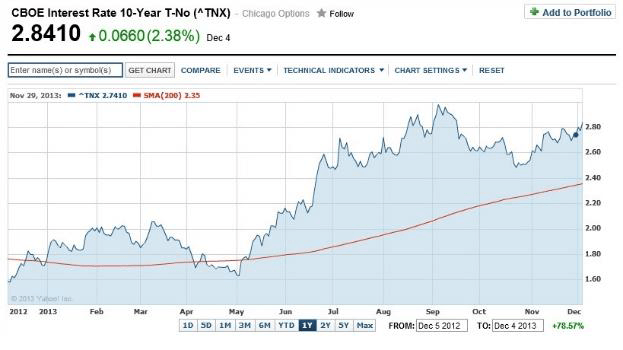 Another factor that comes with tapering is the increase in interest rates on US government bonds. New mortgage loans are often link to these interest rates. An increase will make new mortgages more expensive, leading to falling house prices due to unaffordability of new mortgages. On the other hand, a bottom-up approach should be used. This means picking REITs that are likely to outperform. This could be healthcare REITs or REITs with prime assets can add value to investor’s portfolio. Gold performed badly in 2013. The chart shows that prices went down from around US$1700 to around US$1200. The level of US$1200 seems to be a good support for gold by now. A drop below this price would indicate further selling pressure. Government bonds, especially US treasuries, were for a long time seen as the most stable and secure investment. 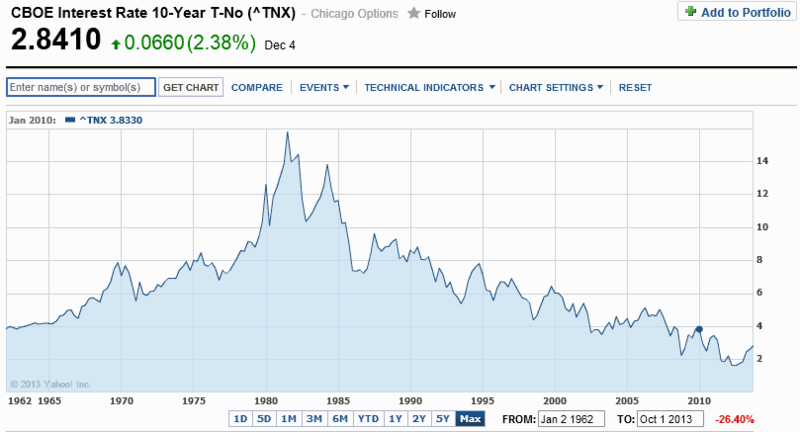 Since the 1980s, US bonds were in a bull market, which can be seen in steadily falling interest rates. Investing in this asset class meant virtually no risk, as the US government issues the bonds, and has the highest liquidity. Times are changing rapidly. One can see on the next page that interest rates on US treasuries are continuously rising. Talks about tapering or even ending QE programs by the US Federal Reserve (the central bank), which became the single largest holder of US government debt since the financial crisis in 2008, is one reason. Another, maybe even more “game changer”, is the announcement by the People’s Bank of China. It declared that it is no longer in the interest of China to increase its reserves2. With China and the FED reducing their bond purchases, it will ultimately lead to rising interest rates and lower bond prices. Looking Ahead! Where to Invest? Mid- to Long-Term Views. We are bullish on equities worldwide, especially European equities. There are various reasons for this conclusion. The scarcity of investment opportunities is the main problem investors currently face: Where to invest to achieve a rate of return above inflation, thus not losing money in real terms. This is especially difficult if one considers risk. Recently, high yield corporate bonds became a much loved investment class. This seems reasonable if one has a look on the yields of these investments, which are usually above 5%. However, huge capital inflows drove bond yields down and prices up, resulting in an adverse risk-return relation. High yield bonds still offer good returns, but an investment is only suitable for investors that are aware of the high risks involved. The two following figures show statistics of loans given to businesses and consumers. Loans to businesses in all three analyzed areas are lower than before the crisis. This is due to the tighter lending conditions that banks introduced after the financial crisis of 2008. However, the lending process in the US picked up at the end of 2010 fueling the current economic recovery that can be observed in the United States. 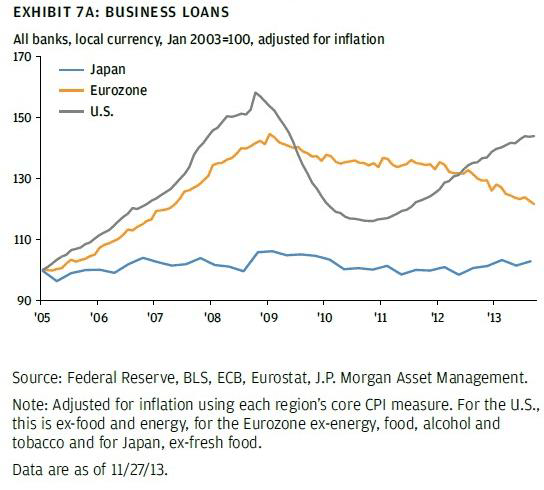 The Eurozone shows another picture; here loans to businesses are still in decline. Making banks lend to businesses will be essential to fuel the recovery of the Eurozone. We think the ECB will do everything possible to revive lending of banks to businesses, which will result in an economic recovery accompanied with rising stock markets. The second graphic shows loans given to consumers. 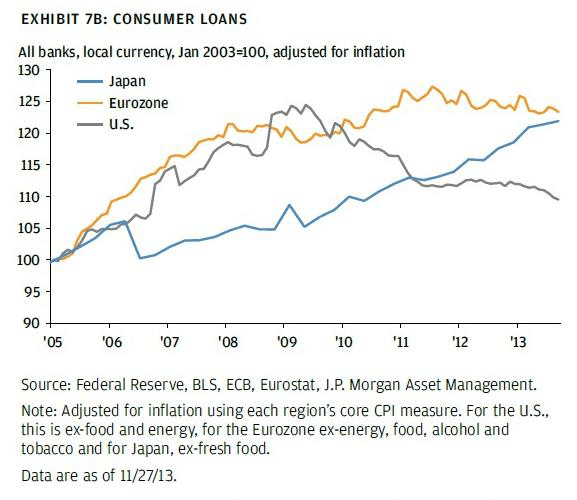 It shows a rising level of consumer loans in the Eurozone and Japan, but a deleveraging in the US. This development was expected, as the Eurozone and Japan do not have as big issues with private debt as the United States. Further deleveraging in the US could not only directly harm consumption, but also the housing and stock market. 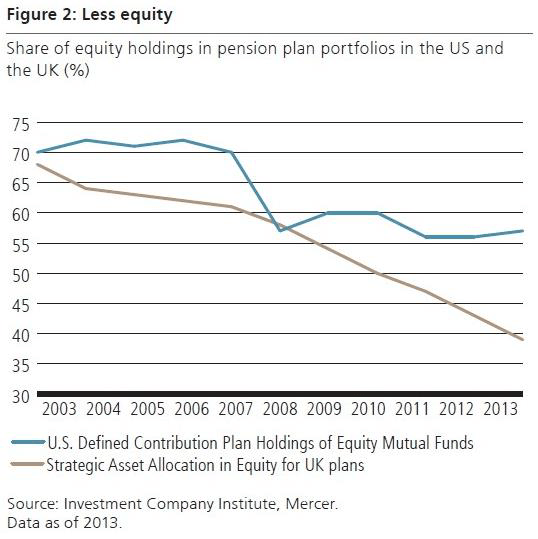 Another factor that makes us favor equity investments over other investments, such as fixed income, is the decline of equity holdings in pension plan portfolios in the US and the UK. In the figure below over the last 10 years, the proportions were decreasing although recently the US pension plan contributions towards equities are turning around. UK pension plans seem to be very underinvested in equities, which gives rise to questions about fund managers being able to achieve their targeted returns. Laurence Fink (Blackrock Inc.) recently said, “Pension funds won’t meet their liabilities unless they put more money in stocks.”3 This increases demand for equities and should drive prices up. Other supporting factors for equities one can find by looking at big fixed income funds like Templeton Global Bond A Fund which has about 45billion of assets under management. Checking the portfolio of this fund shows that almost 50% of assets are held in cash. The reason is the scarcity of good investment opportunities in global bond markets. Fund managers most likely see that returns earned do not reflect inherent risks and it is better to hold cash instead of purchasing overpriced bonds. 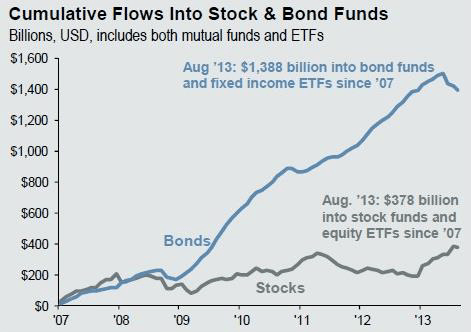 The following graphic shows fund flows into bonds and stocks. A notable movement took place after the financial crisis of 2008 where flows into bonds picked up remarkably. In figures, from 2007 until August 2013 US$1.388 trillion found its way into the global bond markets, compared to only US$378billion in stock markets over the same period. The increase of funds into bonds looks like an inflation of bond prices, which now seems to turn in favor of equities. This circumstance is described by the financial media as the ‘Great Rotation’ out of bonds into stocks4. This great rotation leaves room for interpretation. If all new funds would flow into equities, it would be a great support already. Imagining funds that flow out of bonds go directly into the stock market would fuel another great year for equities on a global scale. In addition, many investors are sitting on huge piles of cash5. This is important from a psychological point of view. Investors holding cash in 2013 were missing out the rally in stock markets this year and will desperately try not to miss the next up move! Our opinion on outperformance of European equities over its American counterparts is also supported by many big institutions. Just to name a few: Citigroup, Deutsche Bank, UBS, Credit Suisse, Morgan Stanley, Goldman Sachs and Societe Generale 6 . Overall, economic growth in the world shows dynamic signs of recovery that should profit equity markets and lift up company earnings and stocks7. The shift from bonds to equities would let bond yields rise, making it more attractive to invest in this asset class. The big question remains, what is the ‘fair yield’ on e.g. US treasuries? This can only be determined by the market, which can only act freely when the Fed stops its interventions. However, it is likely that over the next couple of years yields will rise to 5% or more on US long term government bonds. Stopping market interventions would also mean tighter money supply, which would have negative effects on equity markets. Reduced market interventions by the Fed and other central banks could lead to a rate shock resulting in increased cash holding, rather than in increased equity allocations. Many investors fear that the markets are already in a bubble. They think after this year markets have to go down. As shown before, there are more arguments that speak for equities than against them. Although not all markets and stocks will do equally well, we believe that next year will show gains in major stock markets. However, for investors that fear a bubble, Russ Koesterich, Chief Investment Strategist at BlackRock Inc. wrote an article about how to spot a bubble and came to the conclusion “that evidence still suggests that stocks are not so overvalued, nor investors so exuberant as to justify the ‘B’ word [Bubble] just yet.”8 Irrational behavior might be observed in technology stock valuations like Twitter, Facebook or Qiwi, which, which reminds us of the dot-com bubble. Investors in these stocks are pricing-in enormous growth rates that very unlikely and revised growth predictions will lead to a massive stock price decline in technology equity price levels. We still see China as a great investment opportunity. Although in the short term, the risk of a crash in the housing market exists. Another risk factor is the huge shadow banking system, which is not controlled by Chinese authorities, leaving the nominal risks unquantifiable9. Apart from these risks, there are enormous opportunities. China has the largest population in the world; it has the highest currency reserves worldwide and a highly undervalued currency. The undervalued Chinese Yuan (Renmimbi) gave Chinese exporters an advantage over the years but recently Chinese government officials announced two things. First, China does not want to expand its currency reserves, and will stop buying US government bonds. Second, and more importantly, China wants its currency to become freely traded10. The fact that China is moving towards a more open economy with a freely traded currency shows two things: China is confident in becoming the next super power where the Chinese Yuan will play a big role in global trade and finance. China will move away from an export driven to a more consumption based economic model. We are neutral about REITs for 2014. However, REITs are an essential part of a well-diversified portfolio. Adding some REITs with great future prospects is highly recommended. These REITs include HealthCare REITs, but also REITs that have prime properties in their portfolio. 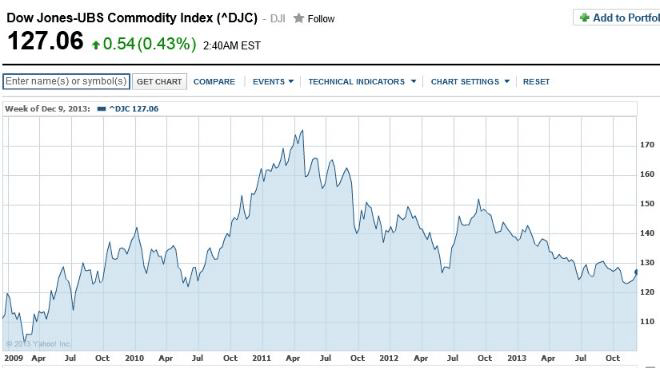 One investment we think is worthwhile considering is the commodities sector. During and after the financial crisis prices for commodities came under pressure and many prices of commodities did not recover yet to its 2008 levels. A healthier global economy should drive up prices for commodities like iron, coal and oil, but also agricultural products like wheat and corn. Investors with riskier attitudes might consider investing in mining or commodity processing companies like Vale SA, Glencore Xstrata, Tata Steel and Alcoa. Our expectations fors gold is a long-term rise. We find it considerably hard to give any recommendations on when to buy gold. Many analysts and investors predict the gold price will drop further. Nouriel Roubini predicts gold will drop to US$1000 by 2015. Goldman Sachs predicts an average price of US$1057 for 2014. Reviewing predictions from BNP Paribas shows how inaccurate gold forecasts are. In May 2013, BNP Paribas was forecasting a gold price of US$1600 over the next 6 month. This forecast did not hold true at all. For 2014, BNP Paribas is seeing a price of US$1095 per ounce. Hedge fund manager Marc Faber sees gold prices to trend higher in 2014 with US$1200 being the bottom. Billionaire Jim Rogers expects the price to be much, much higher over the course of 10 years. He does not see any possibility that governments will stop printing money. Our recommendation to clients and investors is to have a good mix of assets. Our analysis shows that equities are favorable over the next year, with Europe being our favorite market in the developed world. Nevertheless, markets like India, China and Brazil have big potential for economic growth, especially over a longer time horizon. A rise of populous countries will increase demand for basic goods, increasing demand for basic metals and agricultural products. It will also add to the demand for services, like telecommunications and health care. 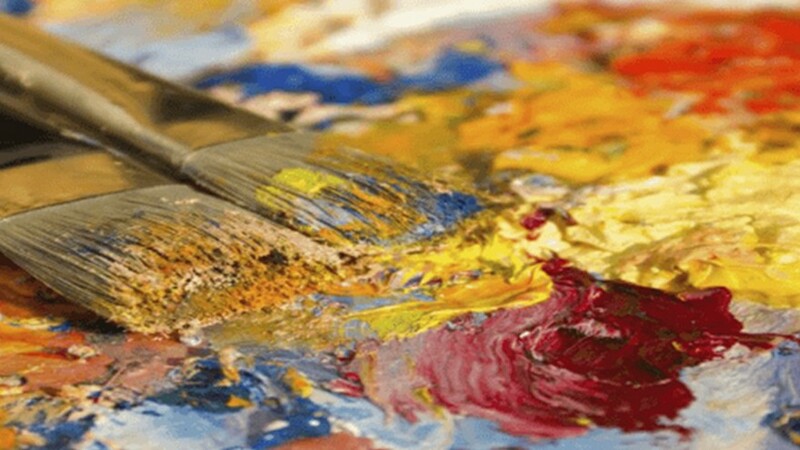 A diversified portfolio can add great value for a client. Shoreline is trying to adjust its portfolios to the individual needs of every client. However, every portfolio should consist of major market equities, with Europe over weighted. In the developing world, we see great prospects in India, making it our preferred investment destination. Investments in China, ASEAN and Latin America/Brazil, or even Africa are worthwhile thinking about but regional risks have to be considered. In our preferred scenario, an asset allocation of 50-70% would go into these asset classes by investing in diversified funds. Fixed income products, like government bonds or corporate bonds are not in our favor for 2014. Investors seeking for fixed income investments with reasonable risks should invest in structured notes, which bear regular coupon payments. Products that Shoreline uses in general offer significant downside protection on the underlying equities. Other investments to consider, as mentioned before, are selected REITs, commodity producers and processors or precious metals. The following chart, prepared by JP Morgan Asset Management team, provides supporting arguments for our appeal towards asset diversification. A well-managed and well-diversified portfolio provides better risk-return trade-offs than a narrowly focused portfolio. 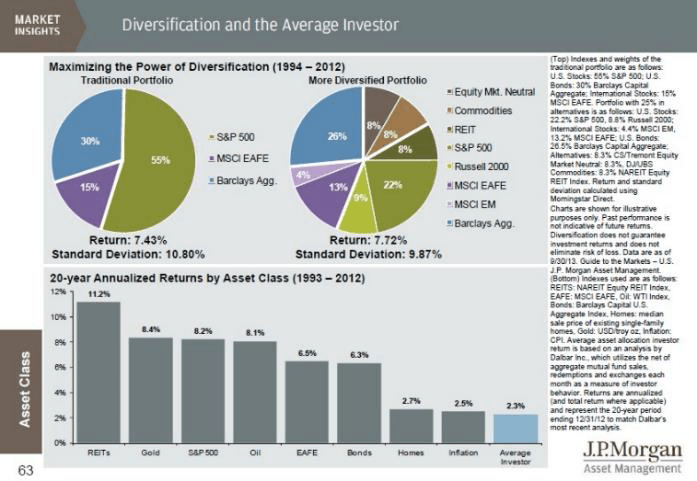 Especially as a well-diversified investment portfolio offers exposure across different asset classes.